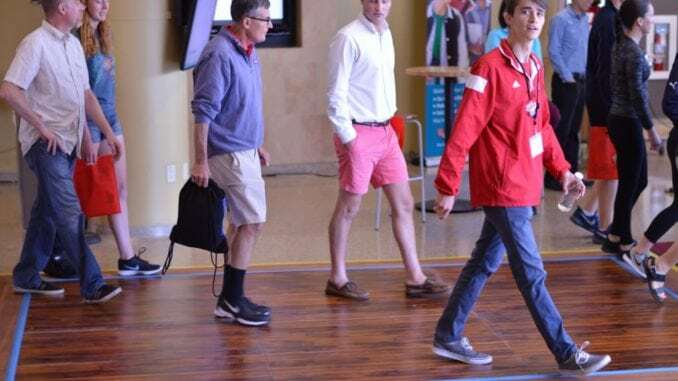 A research team led by Xudong Wang, a University of Wisconsin–Madison professor of materials science and engineering, in collaboration with the UW–Madison Grainger Institute for Engineering, has installed a high-tech flooring prototype that harvests the energy of footsteps and converts it into electricity. The prototype is a 96-square-foot rectangle of modified wood flooring panels located inside the building’s West Johnson Street and Orchard Street entrance. 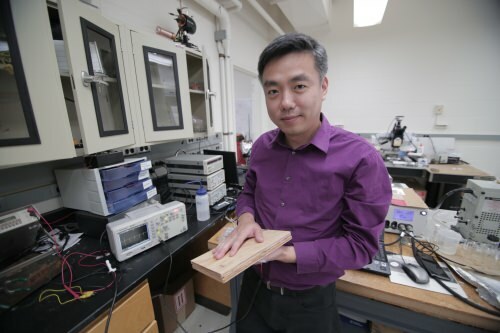 It looks just like typical wood flooring, but its low-tech facade masks innovative technology that could soon contribute to the expanding suite of renewable energy options. The power-generating floor includes an additional green credential in that its functional component is mostly made from recycled wood pulp, an abundant waste material. The wood pulp is central to the technology’s function. The pulp, which is already a common component of flooring, is chemically treated to produce an electrostatic charge when it comes into contact with an embedded electrode. The charge is transmitted through embedded wires, and can power lights or charge batteries. And because wood pulp is a cheap, abundant and renewable waste product of several industries, flooring that incorporates the new technology could be as affordable as conventional materials. While there are existing similar materials for harnessing footstep energy, they’re costly, nonrecyclable and impractical at a large scale. That’s why Wang is so excited about the prototype installation in Union South, which is the result of research first published in the journal Nano Energy in 2016. Wang’s research centers on the use of mechanical energy sources to generate electricity. 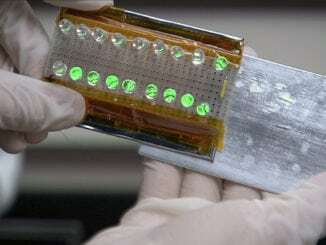 For years, he has engineered different materials to improve a technology called a triboelectric nanogenerator. Triboelectricity is the same phenomenon that produces static electricity on clothing. Chemically treated cellulose nanofibers are a simple, effective, low-cost alternative for harnessing this mechanical energy source, Wang says. Someday soon, flooring like the new prototype in Union South could be used in high-traffic spaces to generate power for overhead lighting or smart building sensor networks. The campus prototype powers an electronic informational sign that explains the technology and tracks the power harnessed by thousands of footsteps over the coming months. 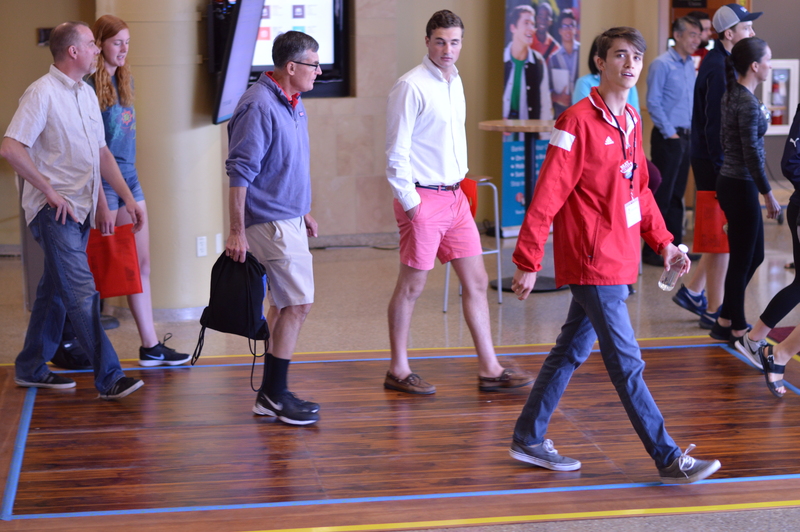 The Wisconsin Alumni Research Foundation holds the patent to the flooring technology, and supported its development through its Accelerator Program. 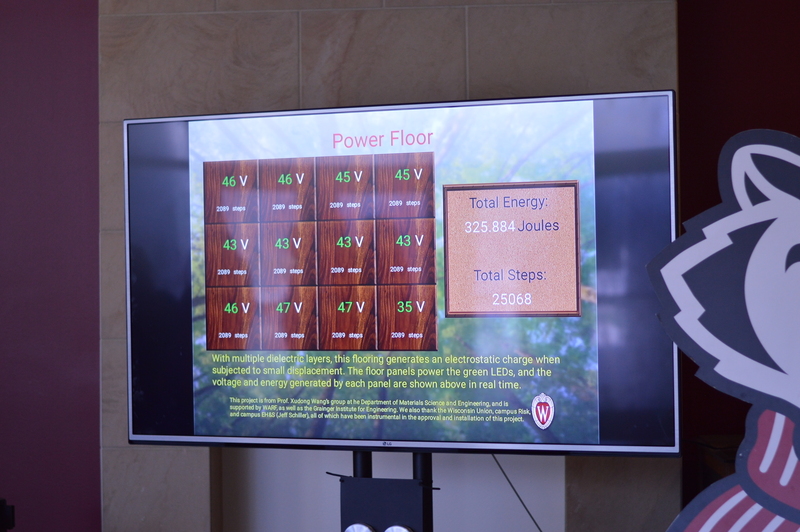 The prototype in Union South is the product of a collaboration among UW–Madison’s College of Engineering, Wisconsin Union and offices of Risk Management and Environment, Health and Safety and the U.S. Department of Agriculture’s Forest Products Laboratory.